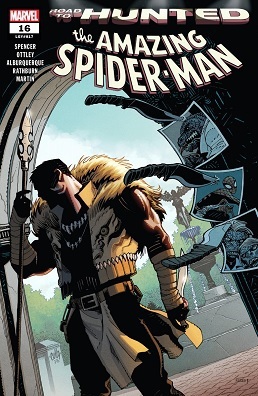 scans_daily | The Amazing Spider-Man #16 (2019) - "Hunted, Prelude"
The Amazing Spider-Man #16 (2019) - "Hunted, Prelude"
I have to admit, there's something appealing in this version of Kraven. 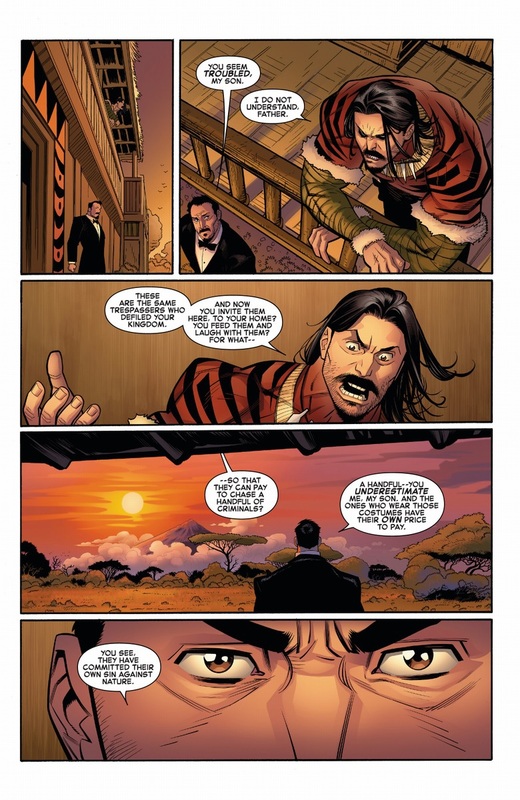 Okay so Kraven and son are in Africa lamenting the senseless slaughter of animals... Yeah I can understand that. So in the words of Killmonger from the movie "Where was Wakanda?" Cloning them by the thousands, probably. And then probably feeding them that cancer cure. Making sure their wall is keeping them out. Because that is the way of a king. By that logic, shouldn't Reed, and Tony be hard at work solving North America's homeless problem? Since when is Tchalla responsible for the whole continent? 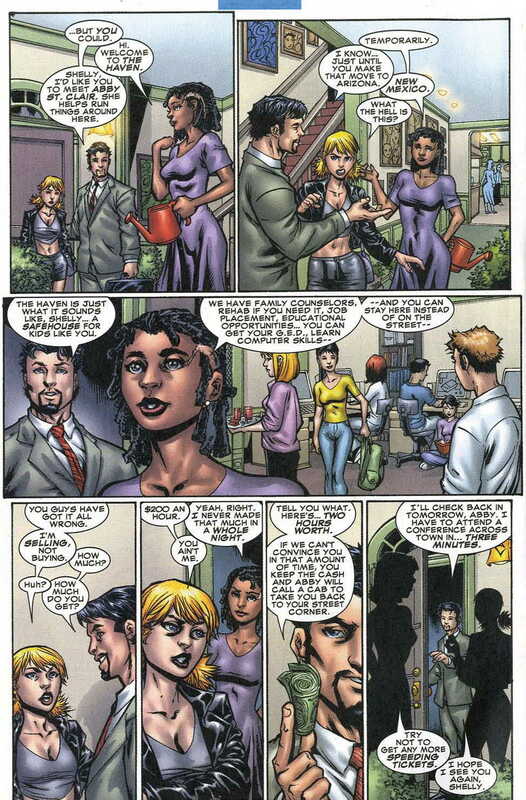 Tony Stark is helping out homeless or otherwise disadvantaged people. 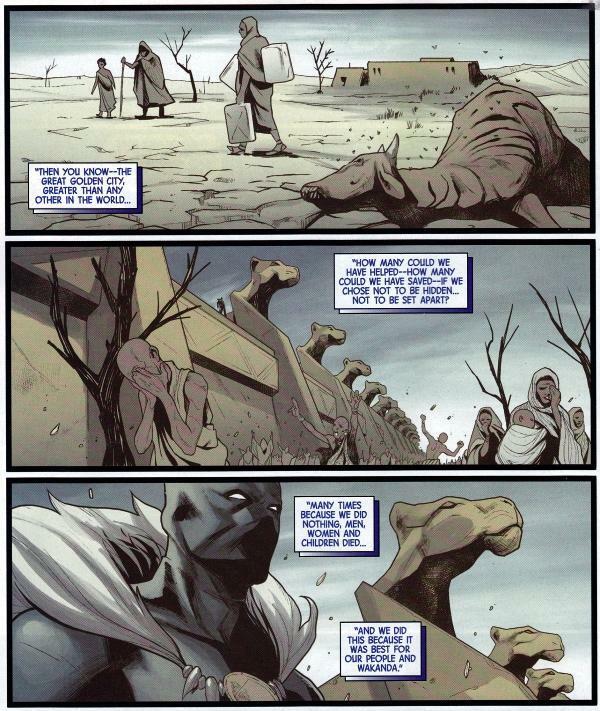 My point is, I don't expect Boston PD to investigate, and solve crimes here in the Bronx, so why should we expect the ruler, and protector of Wakanda to solve every single one of Africa's problems? And good on Stark for completely eliminating poverty in the US. Stark's not eliminating poverty but he's doing his part in helping out the less unfortunate as opposed to putting up a giant wall while starving people beg outside for aid. Killmonger went too far in suggesting Wakanda should police the world by force but he made a number of valid points. Do we have more of that Stark one around here? No but I can try if people are interested. 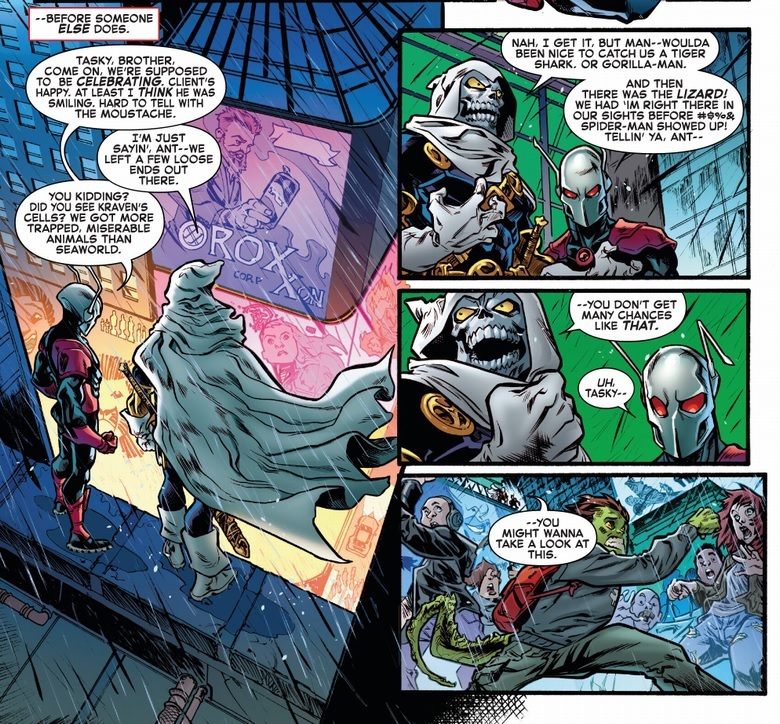 Spencer really likes Black Ant and Taskmaster huh. So when is Black Ant gonna be betrayed & added to the hunt? Isn't Black Ant an LMD with the memories of O'Grady? Why is Kraven sub-contracting the captures to Taskmaster and Black Ant? Is he now doing no hunting himself? Issues of pride aside, if Kraven were the one seen hunting these guys himself, there'd be too big a risk of his plan being exposed before it was ready. 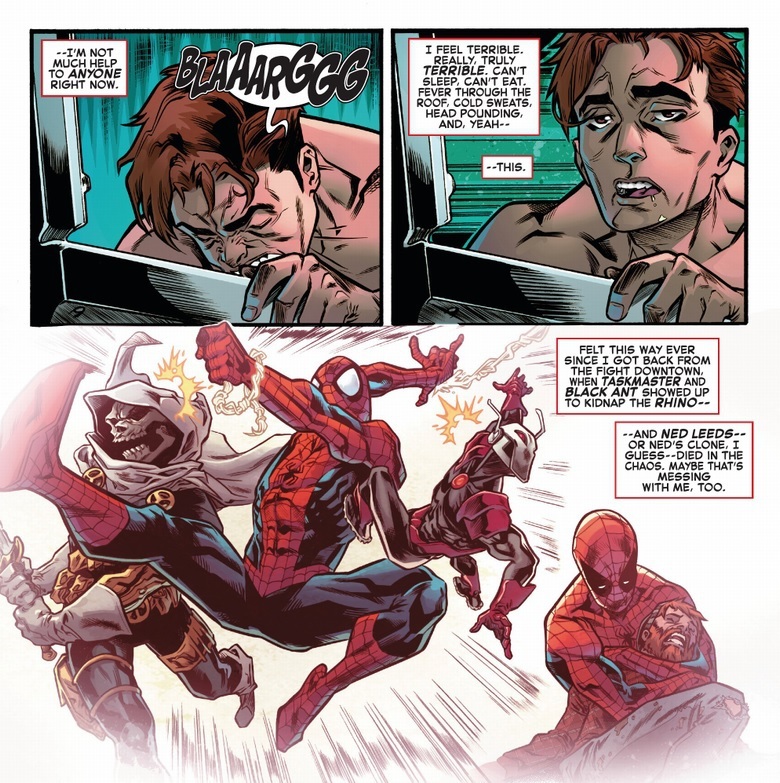 And he may feel this is an essentially noble endeavor, but he still wouldn't want to get into a pointless fight over it with Spider-Man... or worse, Squirrel Girl. Because they’re Spencer’s pet characters. It sort of becomes a problem from a plausibility standpoint though. I mean, I think I see Puma in one of those cages. I could see Kraven getting a lucky hit in and drugging Fireheart if the Puma was having an extremely off day but the is NO WAY these two idiots could take him. Idiots? Man, these guys are actually like the A-List of the jobber circuit. 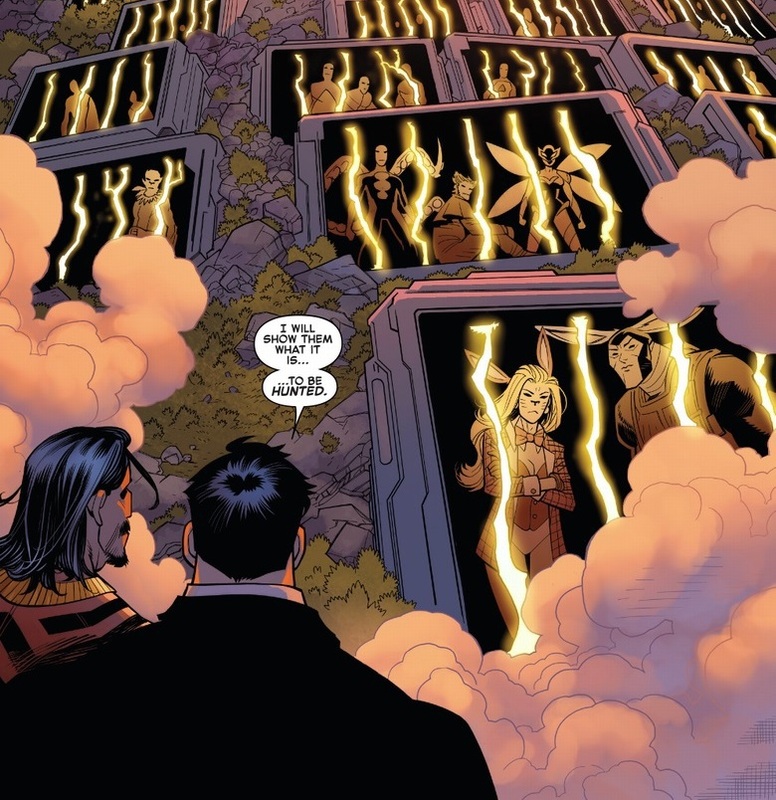 Yeah, they're not going to have a big serious 12 issue story arc where they're making life hell for the Avengers, but that's not what they're here for. They're competent mercs. 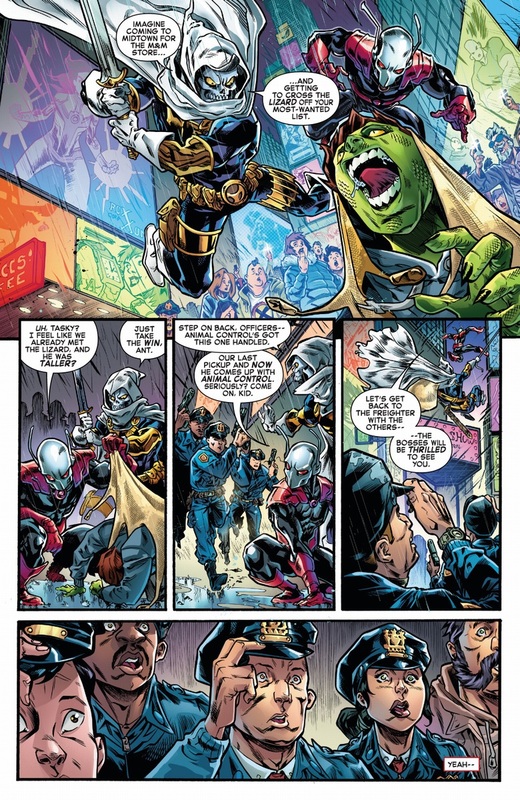 Hell, Taskmaster & Black Ant *were* Avengers, of sorts, multiple times even! Taskmaster has the skills, Eric has the stealth/surprise factor... these two doing hits like this is right in their sweetspot. I don't know about the other guy, but Taskmaster is funny, not incompetent. He likes to chat and chill and is relatively light hearted, but he is still a legitimately experienced mercenary with a pretty good superpower. Before the Worf Effect was used so many times that it made him look ineffectual, he was considered a serious threat against Captain America. This reminds me of that crappy Matt Fraction Punisher arc, where Kraven Jr. has kidnapped all the animal based villains and keeps them in a zoo. This reminds me of why I hate storylines that rely on such thin connections between the participants. Puma, for instance, should be able to tear Kraven a new @$$hole. Mongoose, if he's there at all, would kill everyone. 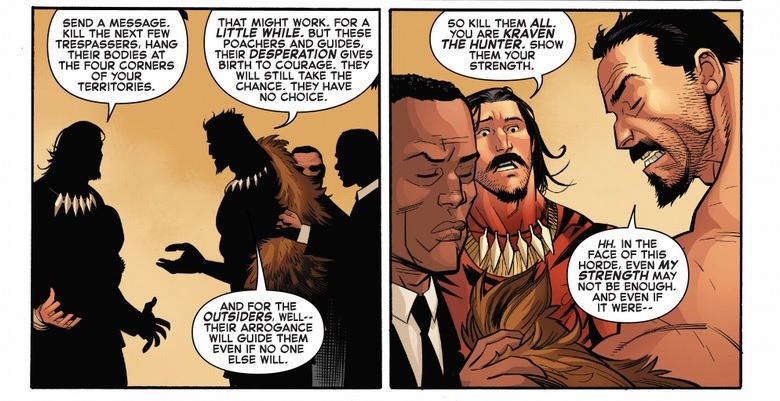 And the Serpent Society should be able to take Kraven and his son apart. But no, they'll just be set dressing. Rhino can take on the Hulk. Kraven's best victory comes from ambushing Spider-Man and knocking him out for a week. Puma was literally created to protect his people from the Beyonder. 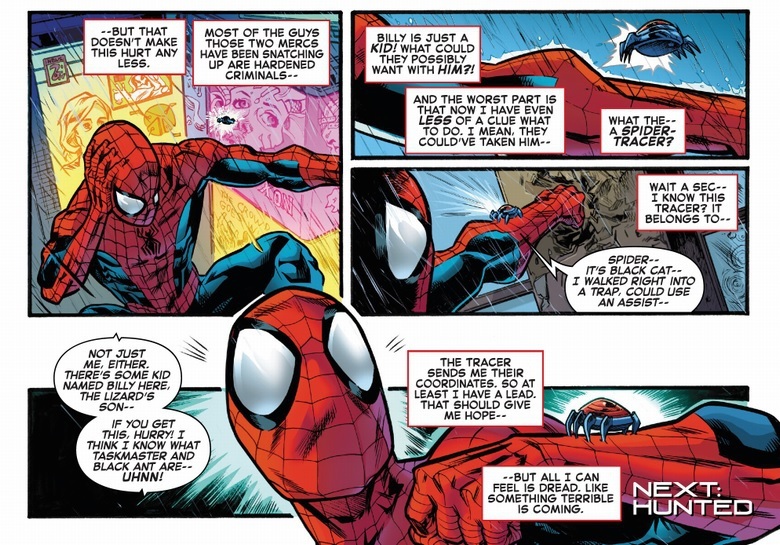 Granted I never saw any evidence that he could but his powers and training are still more than enough to beat Spider-Man. A drugged up Russian aristocrat with a few dirty tricks shouldn't stand a chance. As for the Serpent Society .... surely Sidewinder can just save everyone before Spidey even gets there. 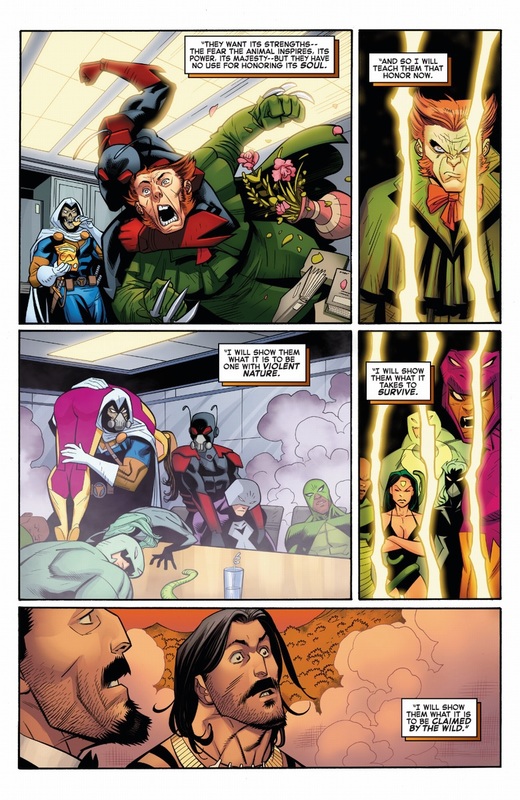 Edit: Isn't Mongoose an actual mongoose that was made humanoid by the High Evolutionary? That seems kinda against the spirit of the thing. If kidnapping Puma is in the 'spirit' of his hunt, I'm sure Mongoose would fit in fine. I mean in the sense that most of these characters are humans who took on an aspect* of an animal whereas Mongoose is the flip side. Then again, some of the characters (like the entire Conners family on a bad day) really ride that line between the two. *Which I guess Kraven sees as disrespect? If so, that's really rich coming from a guy wearing a lion skin vest. This assumes Kraven will be interested in taking them in fair fights. Puma is an experienced merc who's gone toe to toe with Spidey in both speed and strength. His enhanced senses are just gravy. By unfair fight, I mean Arcade-style, since that’s who he’s teaming with. Death traps, robots, and just an all around stacked deck around every corner. I re-read Kraven's Last Hunt this week. I still don't get why Marvel brought back Kraven. Looking forward to the plot armor that will allow Kraven to defeat Hulk level targets like the Rhino though. It was an incredibly tone-dead decision. He's a one-note c-list villain who had one great story that ended with his death. 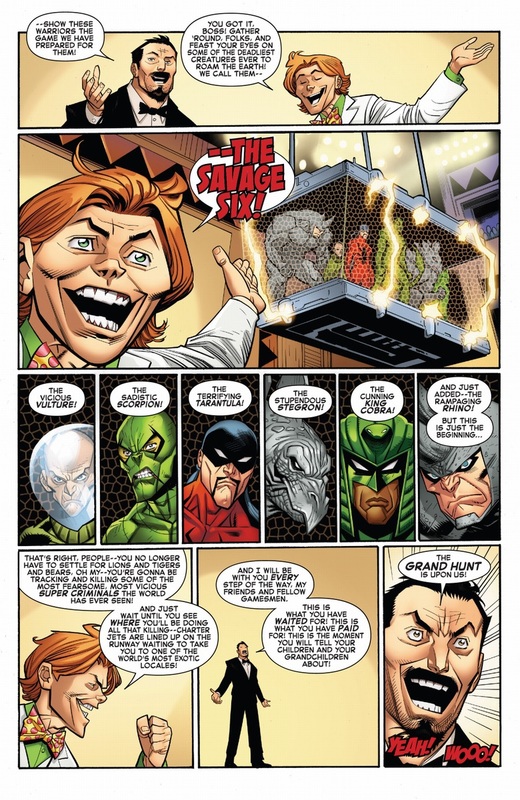 People get mad at bringing back Norman Osborn but he's at least one of Spidey's biggest arch-nemeses. Bringing back Osborn gave us the Warren Ellis Thunderbolts series and Dark Reign. 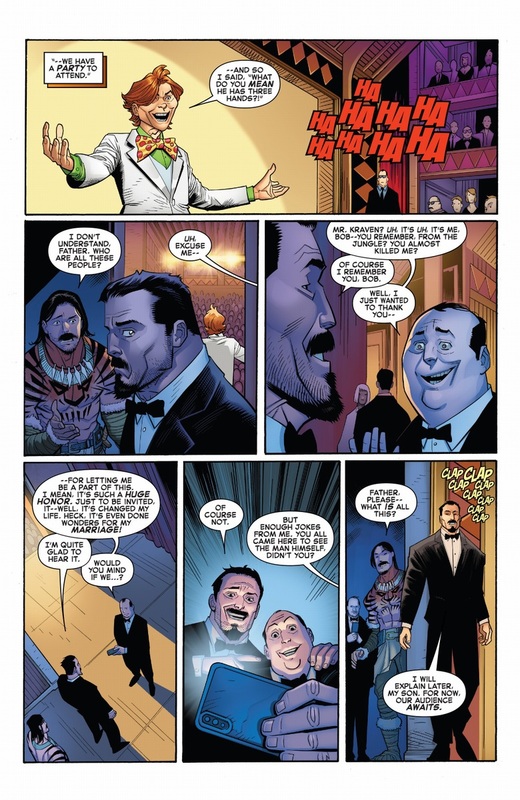 Bringing back Kraven gave us an amusing moment in Squirrel Girl. Plus I don't think Grim Hunt gets enough hate for what it did to some of the female Spider powered people. Because the only people that enjoy undermining great J. M. DeMatteis comics more than DC writers and editors are Spider-Man writers and editors? 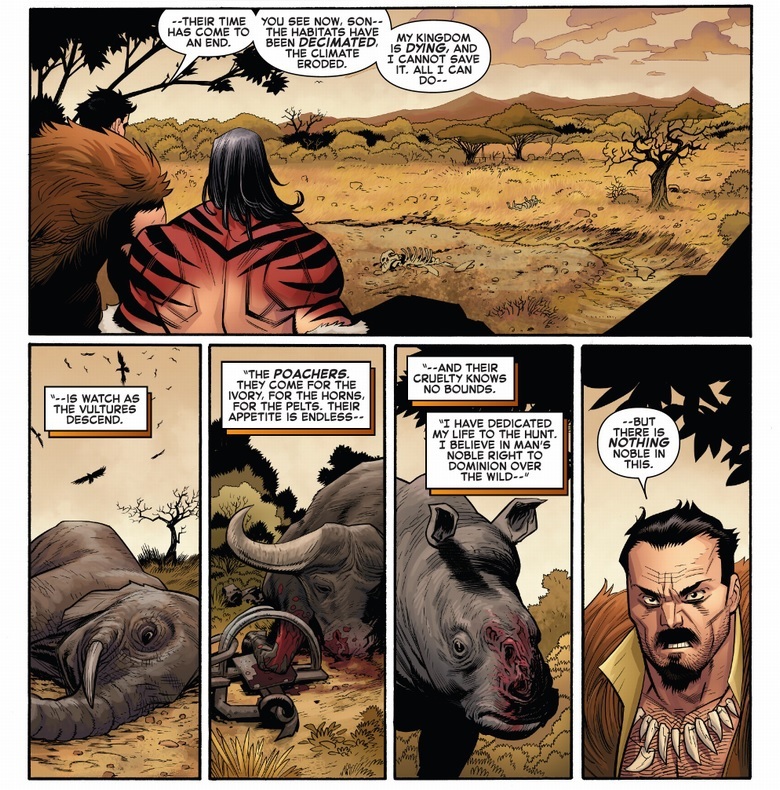 I like Kraven's attitude towards the poachers. He's a hunter, but in his mind he's sporting about it and views it as a contest of strength and wits, so he can rationalise what he does. It's good writing. Segei, Doreen would like a word with you. It is confusing how Marvel keeps using Arcade in very different ways from one appearance to the next, but...comics, I guess. I find the idea behind this to be pretty funny, really. Black Ant and Taskmaster being Spencer's pet characters doesn't bother me. All writers have them and why not? Spencer often comes up with some great ideas, when he gets out of his own way. Sometimes a comic just wants to be a comic. This is no different than some of the crazy nonsense in the 70s and 80s. More power to him, if you ask me. 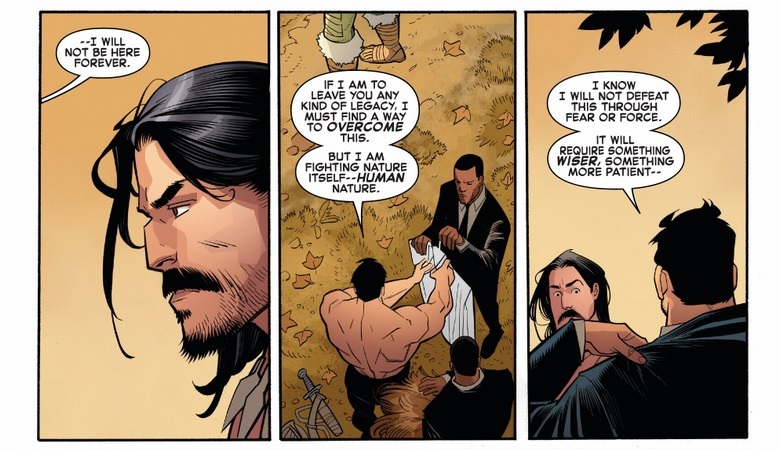 I suspect that Kraven is planning on turning on the hunters he's empowered just as much as the hunted, tbh.